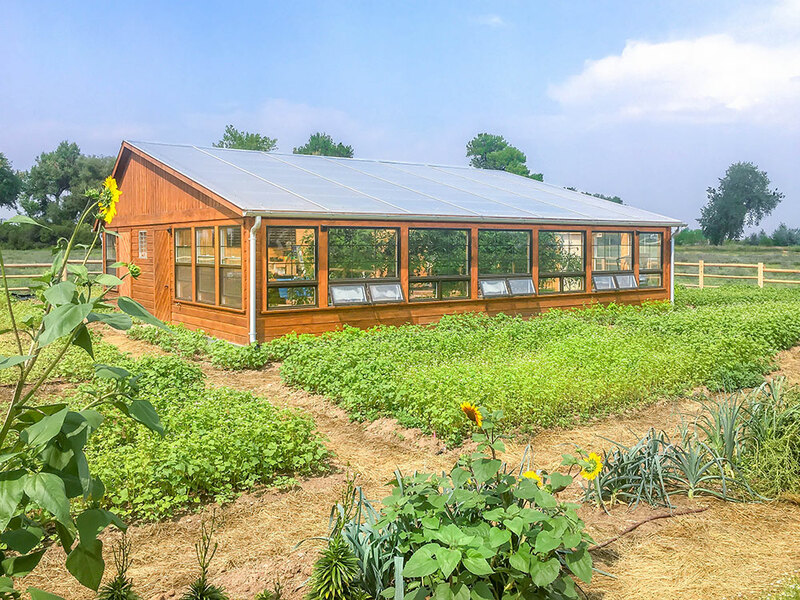 The following is an edited excerpt from The Year-Round Solar Greenhouse. 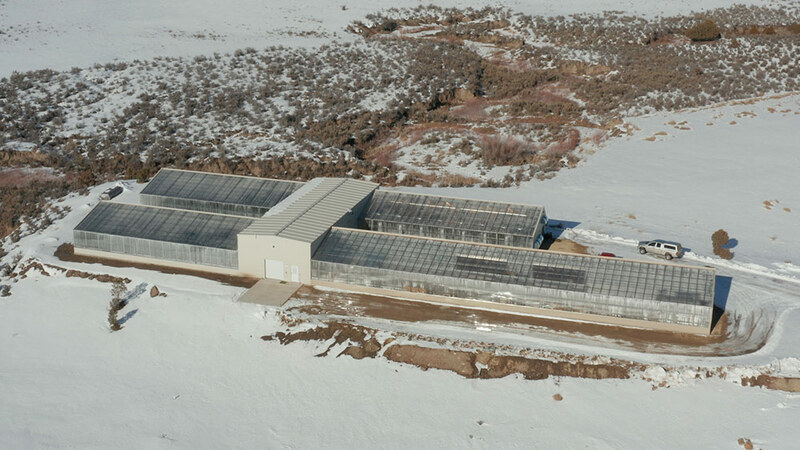 Year round greenhouses, or even those used for season extension, face the challenge of extreme temperature swings. The structure collects excessive amounts of heat during the day when the sun is out, causing them to easily overheat. However, they quickly lose this heat at night due to a lack of insulation. 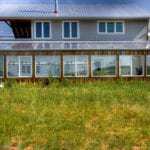 Designing a greenhouse with passive solar greenhouse design helps control temperature swings dramatically. 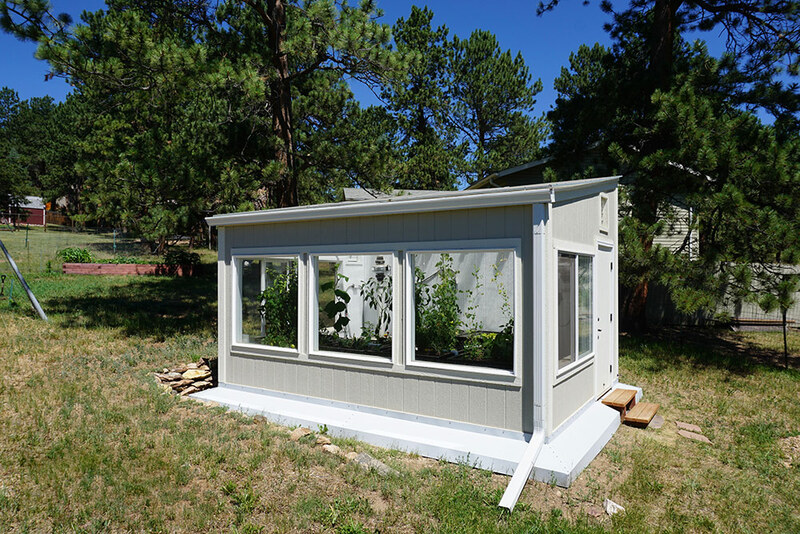 A passive solar greenhouse is designed to strategically maximize light and heat, while incorporating insulation to help retain heat overnight. 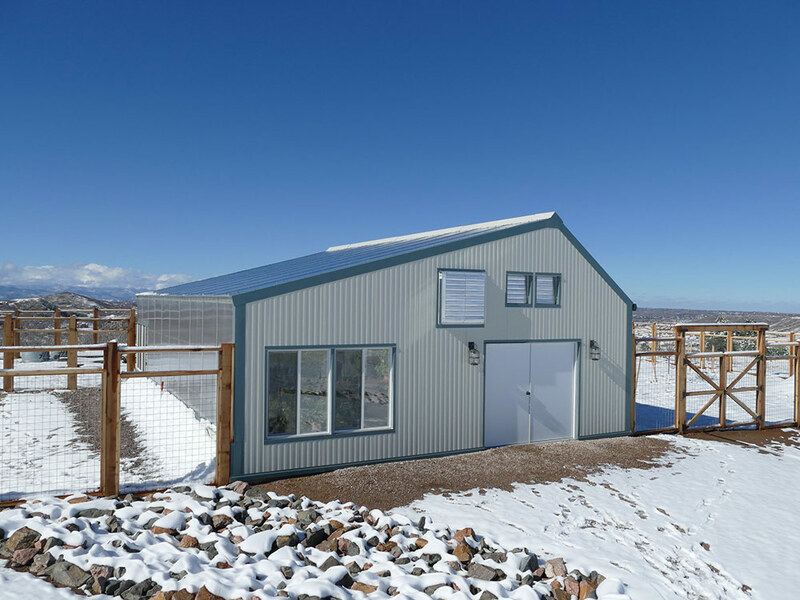 Typically, though, even a passive solar greenhouse requires some added measures to control overheating and freezing. 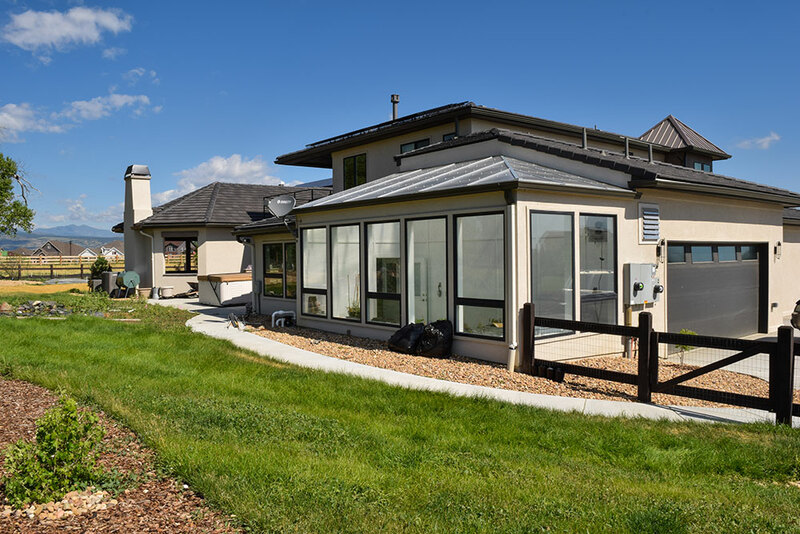 There are a variety of options – a GAHT system to store heat in the earth, compost heating systems, and solar hot water, to name a few. 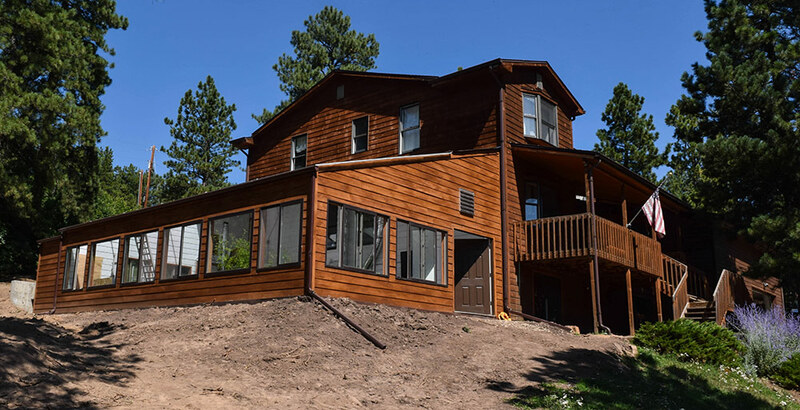 The simplest and most common, is using thermal mass materials like water. Thermal mass materials are dense materials, capable of storing lots of heat. They absorb heat during the day, and slowly radiate this heat back into the greenhouse at night, acting much like a battery. This effect evens out temperature swings, creating a more stable environment for year round growing. 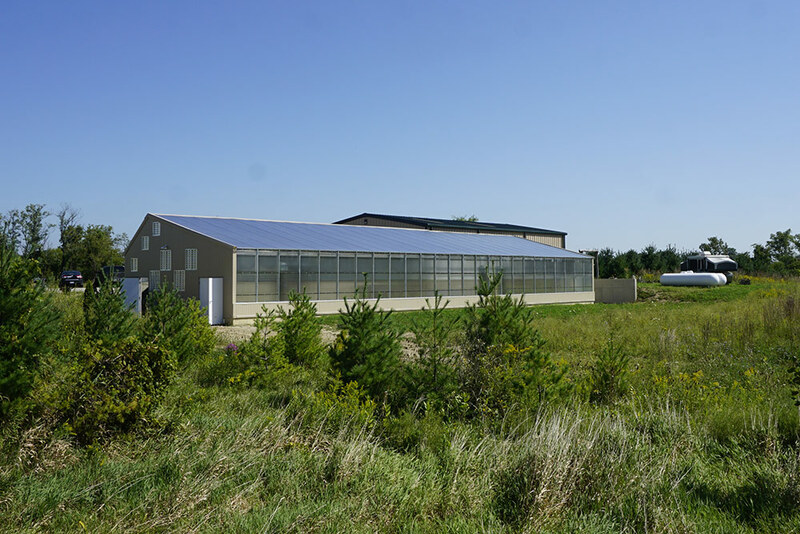 Water is the most commonly used thermal mass in greenhouses for two reasons: it has the highest heat capacity per volume of any of readily available material, and it’s cheap. The only needed component is a storage container. 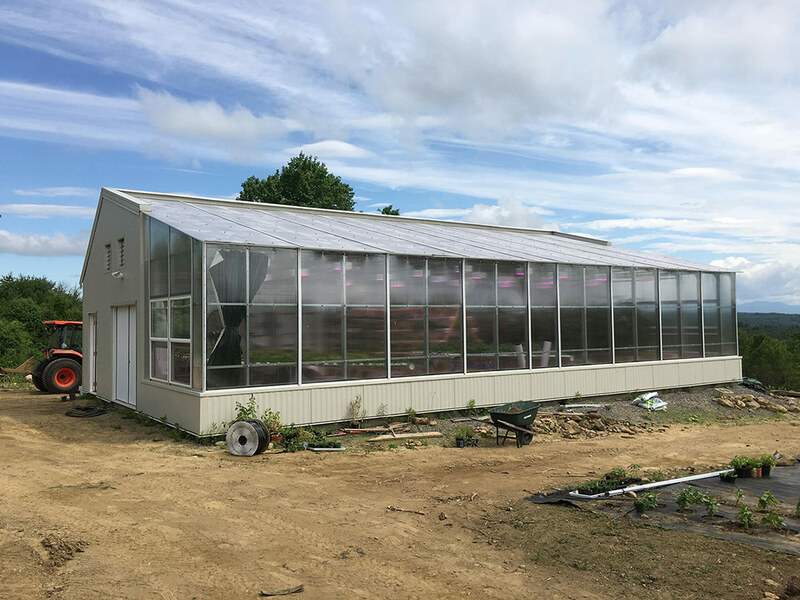 By stacking several large drums of water on the North wall of the greenhouse, a grower can create a ‘water wall’ — a large and low-cost thermal battery for the greenhouse. Smaller quantities of water can also be used closer to plants, however, these are generally less effective, simply because it is hard to stack small containers space efficiently. There are several pros and cons to using water as a climate control strategy. 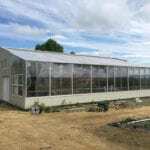 The primary one is that water takes up lots of space in the greenhouse that could otherwise be used for growing. 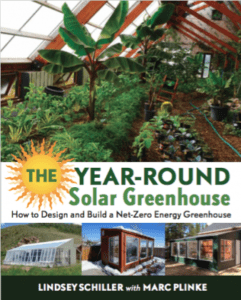 More about the pros and cons in our book, The Year Round Solar Greenhouse. 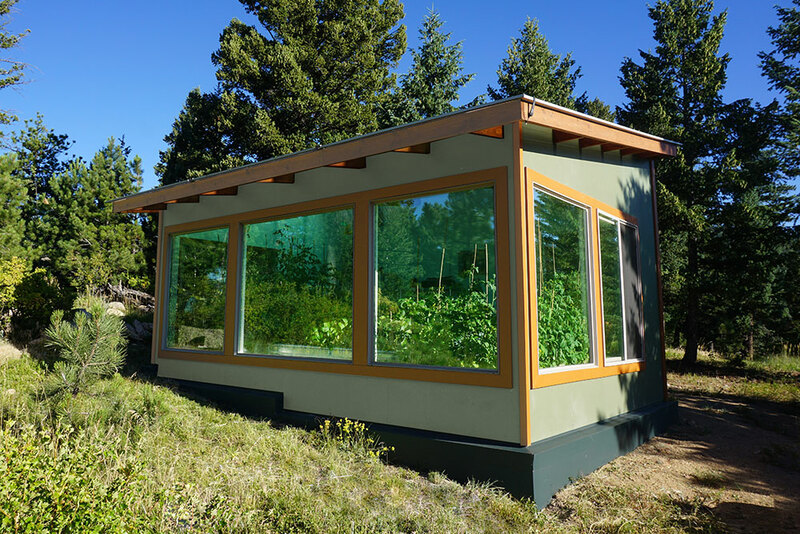 Below we give some tips for integrating water into a year round greenhouse. In the winter months, the goal of a water wall is to absorb as much light and heat during the day, so that it can store this thermal energy for use as heating at night. To this end, water walls should be exposed to light in the winter to absorb as much heat as possible during the day. 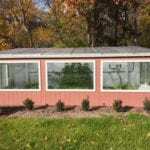 In the warmer months, the opposite effect is desired: in most climates with warm temperatures, the goal is to keep the greenhouse sufficiently cool. Water walls can help by passively absorbing heat from the surrounding air inside. During this time, they should be shaded, unless you are growing something along the wall, like a vining crop. If not, the wall does not need to be illuminated. Keeping it in the sun only intensifies the heating effect during warmer months. 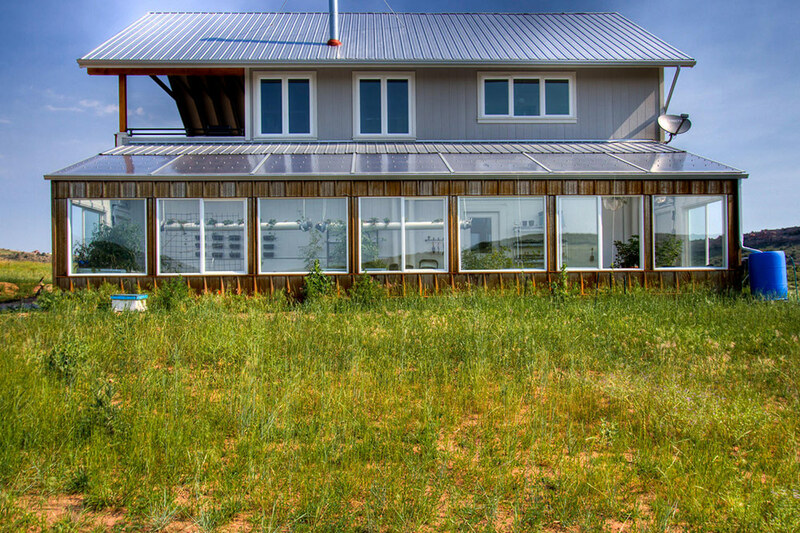 Accomplishing these two tasks – the mass exposed to light in the winter and shaded in the summer — is easily done by placing water barrels on the north side of a passive solar greenhouse and using some insulation in the roof. This is due to the fact that the sun changes angles throughout the year. The length of the insulation determines when the water wall is exposed to light (heating season) or shaded (cooling season) based on the solar angles at your location. 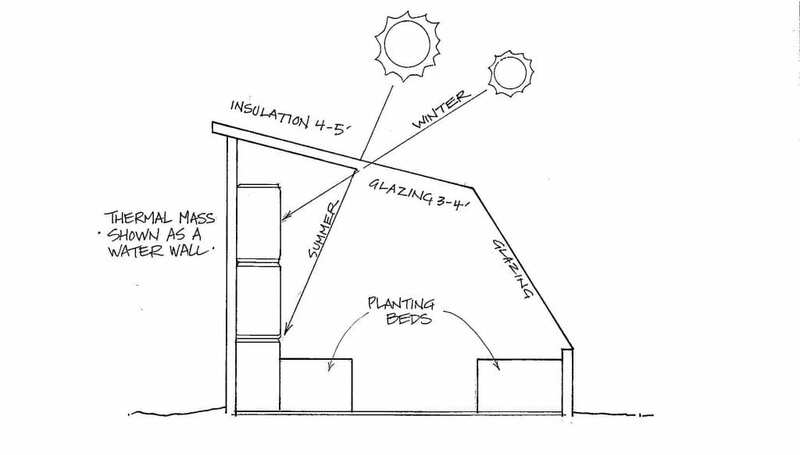 To find the right length of insulation, sketch the greenhouse profile, the dimensions of the water barrels, and the angle of the sun during the summer and winter solstices (and / or equinoxes). 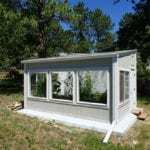 You can then estimate the length of the roof insulation that allows the mass to be shaded in the summer and fully exposed to light in the winter. Though it takes a little longer to build, we strongly recommend adding this section of roof insulation. 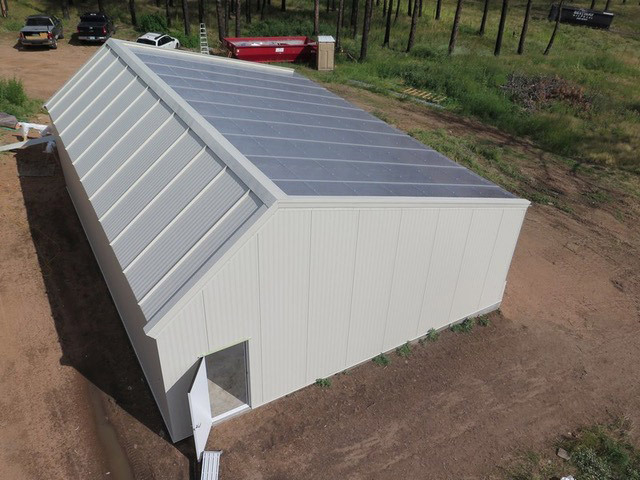 Not only does it enhance the effect of the thermal mass, but also it helps control the temperature of the greenhouse by reducing unnecessary heat loss through the roof. Large water containers are usually 55-gallon barrels, either plastic or steel. Steel barrels are better for energy performance since they are more conductive than plastic. However, they are also prone to rusting and have shorter lifetimes. Barrels usually rust from the outside first, due to constant exposure to humidity and condensation inside the greenhouse. To reduce rust, keep barrels off of wet soil and use plastic lids on top of the barrels to prevent water from collecting in the lid. Most water walls are made out of plastic barrels that can be found cheaply and re-used. Landscaping companies, your local roads / highway department, scrap yards, and Craigslist are be good sources for low-cost barrels. As noted, it’s usually most space-efficient to stack drums, but this comes with a serious need for caution. A full 55-gallon water barrel weights almost 500 lbs.…heavy enough to crush you if it were to fall. Water walls need to be stable and structurally supported. They should be on a level surface. 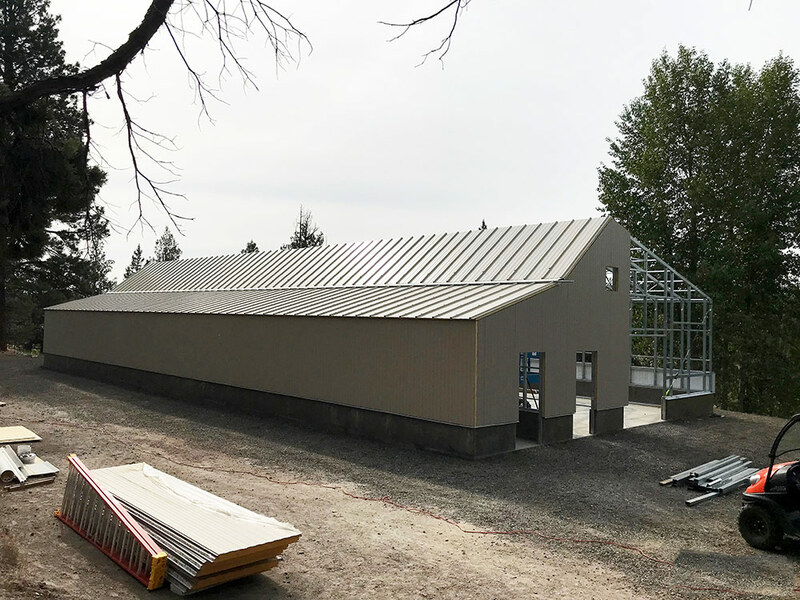 Longtime solar greenhouse designers Penn and Cord Parmenter advise building in a 2’ wide concrete slab on which to stack barrels, while the rest of the floor can be open to the soil. If not concrete, consider other ways to create a level floor like pavers or flagstone. Drums can shift when they are stacked. 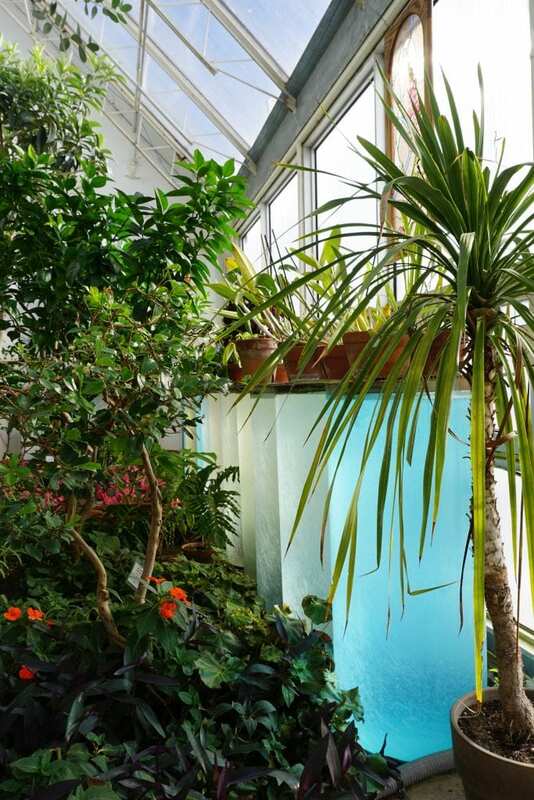 If creating multiple layers of a water wall use a shelf in between layers, such as a painted plywood or metal shelf (shown in the passive solar greenhouse at Cheyenne Botanic Gardens below). Freezing a 55-gallon drum of water is rare, because water gives off a great deal of heat as it changes from a liquid to a solid through the process of a phase change. However, obviously, this can happen if the barrel is exposed to prolonged freezing temperatures. 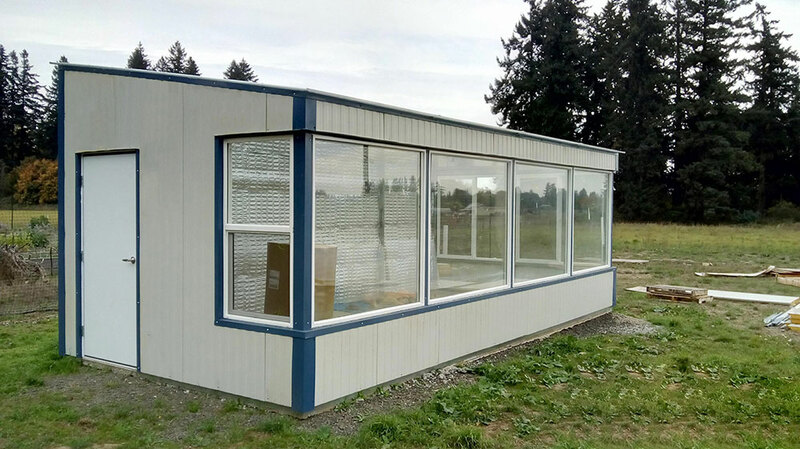 Again, this is a rare occurrence – one that would result in the all greenhouse being killed as well – however it can happen if the greenhouse is un-used and open through the winter. Freezing a barrel will likely break it. Thus, is you are three-season grower who does not plan to use the greenhouse over winter, you will need to drain the barrels. This makes a water wall cumbersome; there is probably a better heating / cooling option for your situation. An additional tip is to leave a small air gap at the top of the barrel when filling it. This is because water expands when it warms up during the day. 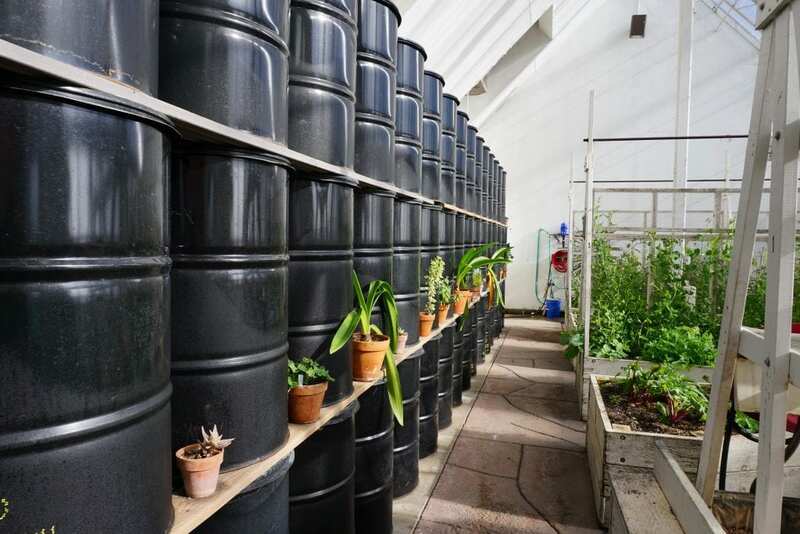 After barrels are installed in the greenhouse, fill them on site (since they are too heavy to lift) leaving a small gap at the top. Dark colors absorb more heat than lighter colors. Conventional wisdom says to paint drums black. This comes with the drawback that now the greenhouse has a large black wall, which can detract from the feeling of an open green space. Some studies show that blue or red colors absorbs roughly the same amount of heat, and reflect light in the red and blue spectrum that plants need for growth. There is also the option to be creative with water barrels, making them both effective and aesthetic. 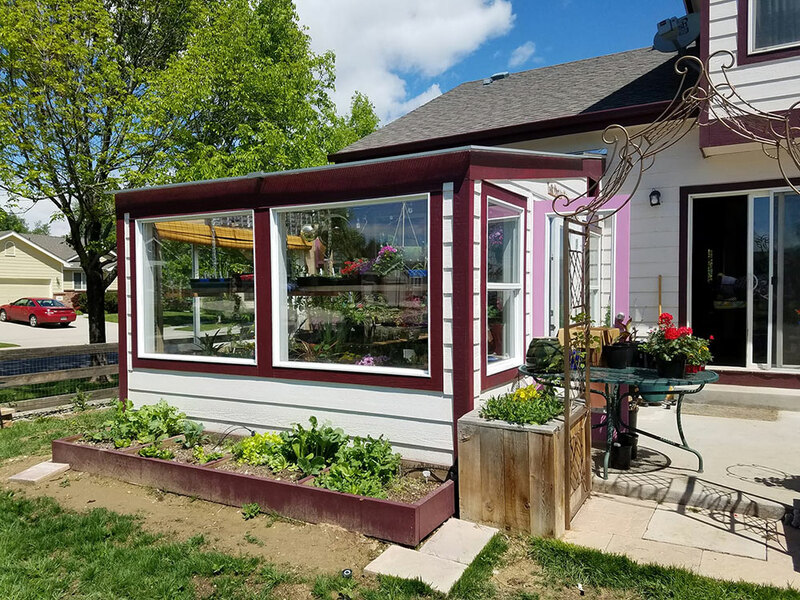 At the Cheyenne Botanic Gardens in Cheyenne Wyoming, for example, tall columns filled with light blue water add to the colorful solar greenhouse. The designers wisely added a fungicide to the water to prevent any algae growth (essential if using a translucent container). 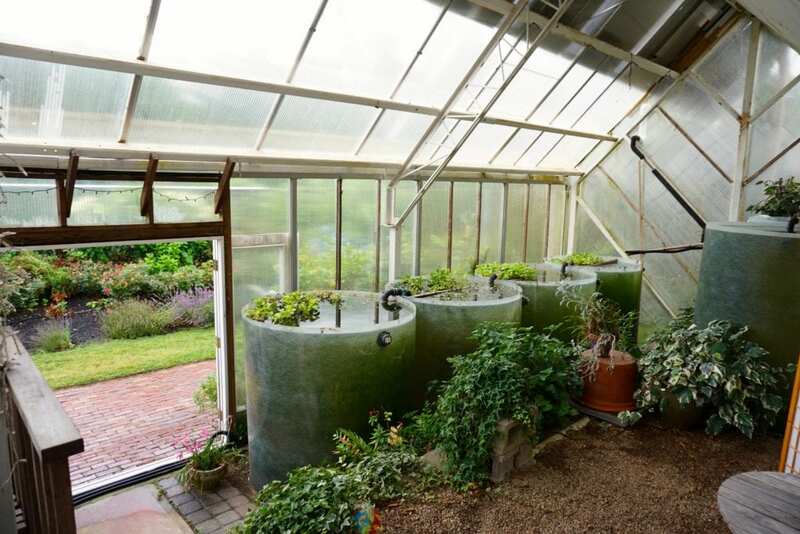 Other growers integrate fish or plants into their water barrels, as in the solar greenhouse at the Green Center in Cape Cod, Massachusetts. 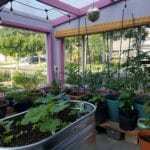 Water containers as thermal mass are a nice feature of aquaponics greenhouses. Keep in mind that when open barells are prone to algal growths if exposed to light. They will also increase humidity in the greenhouse in the winter, which raises the risk of pests and molds. Thus, if used solely for climate control we recommend using closed and opaque containers. A major drawback to large water containers is that they take up considerable growing space in the greenhouse. (A 55-gallon drum is 2’ in diameter.) 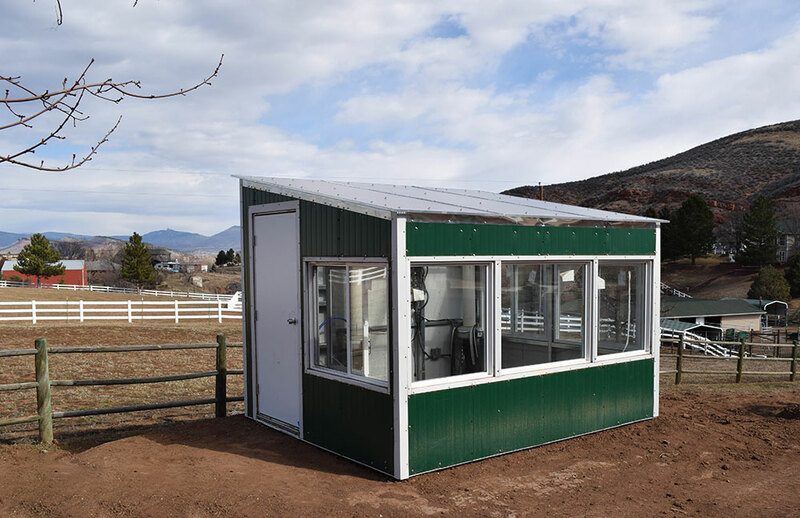 It’s critical to plan the location and spacing of mass when designing your greenhouse floor plan so you don’t end up with too little growing room, or awkward walkways. 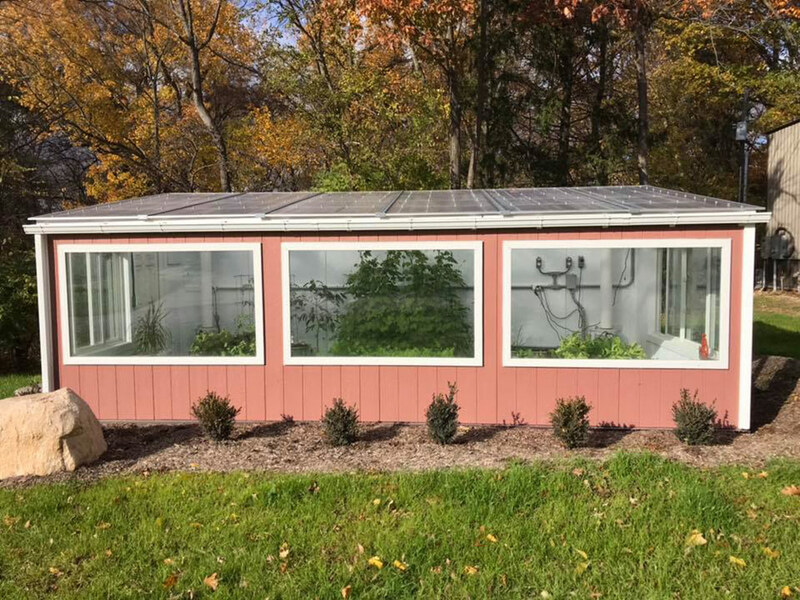 What are your questions about year-round growing and residential solar greenhouses? Let us know by submitting a comment below or emailing us at info@ceresgs.com.